To qualify for the 2020 Tokyo Olympics. To help you believe in your dream…I need to achieve mine first. In the last race I did, I spent the entire bike leg on the small chain ring ‘cause I didn’t have the strength to push a bigger gear! Wille Loo: Hi Greg, thanks for setting this up. I’m definitely far from famous! 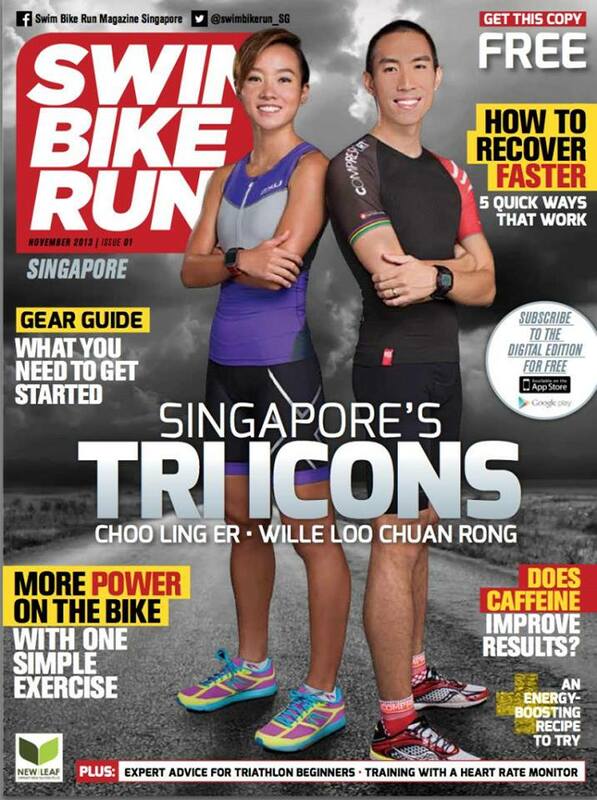 It is nice to have customers come to the store saying that they saw me on the cover of SBR Singapore. GB: Before doing triathlon, your first sport was swimming. At that time, was swimming just for leisure or did you already have a competitive spirit? What motivated you to switch to tri? WL: I swam competitively till I was 12. I was training every day at that point so it wasn’t too leisurely. When I was in high school, I was looking for a bit more variety but was reluctant to give up on swimming. I joined the water polo team and loved it. I played water polo up till I was in the army (21 yrs old). While in the army, I met a very good friend from my swimming days and he was now a national triathlete. He told me many stories about his racing overseas so I was intrigued. I needed something after water polo and triathlon sounded super exciting, so I bought a bike and that’s it! GB: Your first triathlon goes back to 2004. Can you share this first experience? Which race was it and what was it like? WL: My first race was a sprint distance race organized by the local university here in Singapore – the NUS Triathlon. It was held down in Sentosa. It was very fun. I remember coming out of the water in a good position. I had only started cycling so I worked very hard during the race. After T2 (transition 2), I had nothing left and also had the worst stitch in the side of my stomach. So I walked and jogged my way to the finish. Hard work, but a real good time. GB: I am sure the triathlon world was different back then. Can you compare the early 2000’s and 2013? WL: Triathlon clothing was a lot less conservative! The guys often wore 2 piece tri suits that consisted of a sports bra-looking top and either swim trunks or tights. The bikes were less fancy. Athletes just showed up in whatever they wanted, but now it’s a bit more technical. Bigger numbers nowadays, but the early races I did were great. Athletes that took part were the early adopters (for Singapore) of triathlon and I think more passionate about the sport in general. WL: Probably Ironman 70.3 Singapore in 2011. It was one of those races when everything came together. Out towards the front after the swim, I covered all the moves on the bike and broke away with 2 others 10km from T2 then ran a great half marathon. I wasn’t able to run as much as I wanted to leading into the race, but I felt super and didn’t even need my gels on the run. That was my PB race for the 70.3 distance. WL: Ironman 70.3 Philippines in 2010, I think. I had been training really well but 2 weeks before I had a horrible viral flu. I was on antibiotics and still had a fever + sore throat when I flew over for the race. I held it together on the swim and the run but then the wheels fell off. My heart rate was going through the roof but I was already walking. I walked more than half the marathon. I spent the next day in bed after the race, I lost 4kg during the race alone. GB: Today, what do you love the most about this sport? WL: That after you take away the technological advancements, it’s still a sport about who is the strongest. Every race is different and there is always a way to be faster, stronger. You’re not just competing against the rest of the athletes, but with yourself. GB: What inspires you to do this? Do you have a favorite movie? What do you listen to on your iPod’s “ironman playlist” when you run? WL: I’m a huge fan of Macca (Chris Mccormack). He’s been around a long time but he’s a super competitor and can get it done across any distance. Favourite movie is either Zoolander or Dodge Ball – not particularly motivational for triathlon! I listen to music on the bike but not on the run. Usually some hip hop and rock, but I’ll listen to anything to with a good beat. Right now it’s John Newman’s “Love me again”. GB: You studied in Australia and you sure traveled a bit. Can you share with our readers who don’t know much about Singapore, what’s it like to live here? WL: Singapore is a small country that is filled with people and cars. We have more than 1 million vehicles for a population of about 6 million. There are probably two options when it comes to the weather – Rainy & humid or No Rain & humid. Sports, unfortunately, is not a huge part of life in Singapore. Triathlon, especially as a niche sport, gets very little public recognition. Life can be a bit hectic in Singapore. From school to work, it is usually go,go,go! GB: You’re now the Managing Director of “The Runner’s Gait”, a store in Singapore, opened since 2011, specialized in lightweight shoes. How did you come up with such project? WL: As an athlete myself, I found it a struggle to get what I wanted when I went to the shops. Running was gaining in popularity and I thought it would be a good way to get into the sports industry and reach out to more athletes. I’m very focused on delivering excellent service and value to my customers. For 2014, we’re making a big move towards triathlon, which had been a real goal of mine. So now, our mission is to not just be the best running store around, but the best triathlon store! GB: In my opinion, if you train for a marathon or a triathlon, it means you feel like a super hero inside of you…therefore, I always chose my running shoes thinking “Which shoes would a super-hero wear?” 😉 What are your favorite running shoes of all time? WL: You have to wear a pair of shoes that make you feel fast. And when you get the right ones, you know straight away. My favourite shoes are the Nike Katana Racer 3. Unfortunately, they’ve been discontinued! GB: I told you that in your store, you should have one side “lightweight shoes” and one side “jewelry”, but you didn’t like the idea! 😉 What is your vision of the “Runner’s Gait”? What is the sports store of your dreams? WL: If ‘jewelry’ can also mean ‘super cool bicycles’, then we might be on the same page now! I’ve just started as a dealer for Cervelo bikes. This year The Runner’s Gait undergoes a transformation to just “TRG”. We remain dedicated to running, but now we can reach out to the multi-sport crowd. My dream store would be a couple times larger than the one you visited. It’ll be a triathlon super store. Everything you need, and more things that you want. GB: You’re also married. How did you propose to your wife? Singaporean style with a text message or did you play it French style and got down on one knee? WL: I kept it old school and got down on one knee, of course! I cooked dinner at home and slipped in the proposal some time later in the night. GB: So you got a triple status: entrepreneur, husband and triathlete. How do you prioritize the 3? What is your trick to balance training, work and family? WL: I’m still trying to figure out what the trick is! Husband comes first then work then sport for now. Work goes on regardless, so I value the time I get to train a lot more now. Sleep probably has been sacrificed the most to accommodate the rest! GB: Deep inside of you, what question would you have wanted me to ask you? WL: What’s my secret to maintaining my schoolboy looks and boyish charm? GB: Can you please answer it? WL: Being happy and content with what life has given you. But also continuing to have dreams to chase. GB: Let’s talk a bit about the future to finish. Do you have any racing goals for 2014? WL: I plan to return to racing this year. I haven’t done much in the last 2 years and I miss it. I plan to focus on the standard distance races. It is a bit easier to balance, time-wise. But I also hope to be in the frame to qualify for the Singapore triathlon team for the 2015 SEA Games, being held here in Singapore. GB: Now close your eyes and imagine…We are in August 2016. It’s the morning of the olympic distance triathlon of the Olympic Games in Rio. Who will win the gold medal? Javier Gomez, one of the Brownlee brothers or me? WL: Right now, I’ll put my money on Gomez. I might change my mind after I see your results from Auckland. GB: I see, I see 😉 Thank you so much Wille! 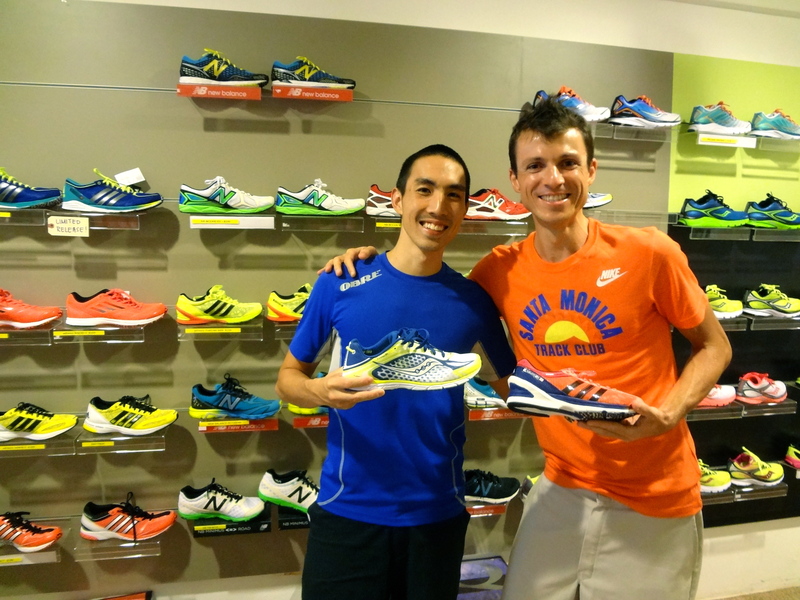 It was awesome getting to know more about you, Singapore, triathlon and of course the location of your shop! Wille is passionate and specialized about what he does which, according to my experience, is the guarantee to meet someone kind and interesting. When you go to his store, give him a shout out from me! You can find Wille on Facebook and follow his blog. His store is located at 99B Soo Chow Walk, Singapour 575384. The bigger the dream, the bigger the team.